Swiftly gaining popularity in the realm of fitness and weight loss is infused water. I first heard about infused water from my coworker, who came into the office with a bottle of water and other things (infused things). Right off the bat, it became something I was eager to try. After a brief consultation with Google, I learnt of its many benefits and simple recipes. I can’t recall if the conversation that sparked my interest was about detoxing or weight loss, but infused water is recommended for both. My first bottle consisted of cucumber, lemon and ginger. This mix is inexpensive and perfect for reducing belly fat. Infused water is basically any combination of fruits and vegetables … in water. 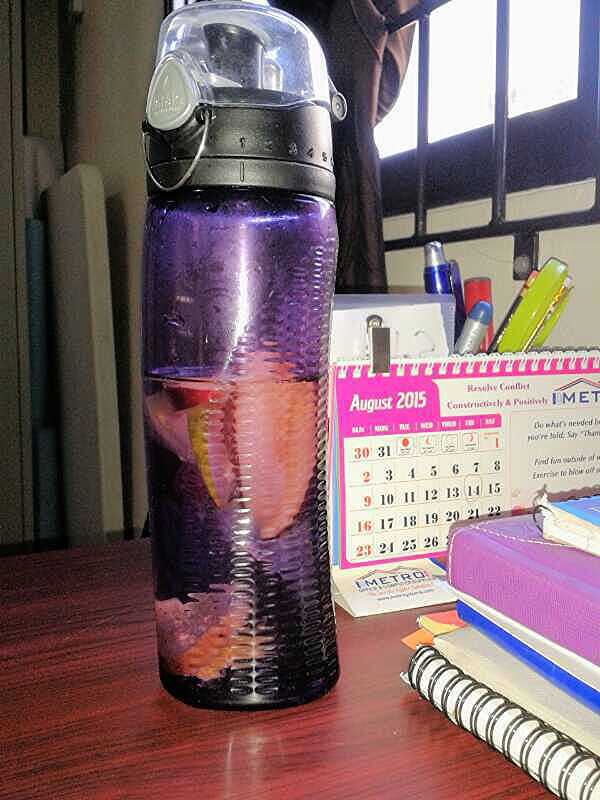 The amazing thing about infused water is that it has no calories thus contributing to weight loss and good health. The health benefits are enormous, most significant is that it keeps you hydrated. Hydration is important for a functioning body and mind. Additionally, infused water makes you feel full preventing you from consuming excessive food, improves your mood, reduces muscle fatigue, keeps your focused, improves your metabolism and rids your system of toxins. Basically, the benefits of water with the added benefit of flavour. By consuming infused water you are supplying your body with the fuel it needs to function efficiently. Also on the plus side, water adds to the beautification of your skin. So the more you drink, the more you glow. Many persons neglect to consume water on a regular basis, not only because they’re busy, but because it’s tasteless. By adding a bit of taste, infused water is an ingenious way to encourage persons to consume a sufficient amount of water daily. Infused water is quick and easy to make. Mix a few fruits and vegetables of your choice, allow it to set for some time then pack for your daily use, it’s that simple (and healthy). 1. Mango Ginger Water: the two ingredients combined help to boost your metabolism. Let’s not forget the wonderful powers of ginger. If you’ve lived with a grandparent(s) you would’ve heard of all that ginger can do including relieving pain. How: To peel the ginger use the back of a spoon or a vegetable peeler, just peel the part that you will be using. Using a sharp knife slice ginger into 3-4 coin sized slices. You want them about the size and thickness of the coin. Drop into your pitcher and add in the mango. Top with 3 cups of ice and then add with water. (the ice is important, it holds down the ginger and mango to help infuse the water). Place in your fridge for 1-3 hours before serving. When serving add a couple frozen mango chunks in a pretty glass for ice cubes. How: In a large pitcher add the lemon and cucumber, then the ice and then water. Let sit in the fridge for a few minutes before serving. Pour into a large wine glass, put your feet up and relax. Once the water is down to only 1/4 full refill with water. You can do this several times, keep in the fridge.